TripAdvisor is making the news lately for raising the business listing subscriptions based on their new formula that tries to assess the amount of revenue the listing brings to your property. This has directly affected a few properties we work with and countless other we’ve heard about. But even if TripAdvisor hasn’t hiked your rate exponentially knowing how to calculate the value of your listing through data should help you make more informed decisions on where to put your marketing dollars. Let’s first check out the formula that TripAdvisor is using to justify the rate increase. As you can see they have a nice formula taking the traffic you receive from your listing down to the estimated booking value to show how your property is benefiting from their business listing. They do the same with their estimated phone calls. However, they are marking several assumptions (based on industry standards) to get to that booking value for your property. Based on this formula they justify an increase in price because they are still providing a positive return-on-investment (ROI). In the case of one client they were claiming a 5.2x ROI on their listing. However, we had our own data that we matched up to their data to get an accurate picture. In their case it was very wrong. We’ll go through a few different scenarios that will apply to different situations and the tools you have available to you. If you have connected the eCommerce feature of Google Analytics to your booking engine then you can track the bookings through your website from various sources and actually see the dollar value they provide to you. Go ahead and select your dates to show you the previous year on the anniversary of your business listing renewal. Select “Compare To” below that and set the previous year. This will let you see last year vs. the year before so you can see a trend. Go to “Acquisition” > “All Traffic” > “Referrals”. Find and click on TripAdvisor (will be one of the sources). Here it will tell you the total traffic you received and some other details. All the way to the right you can then see the total conversions and the value of those bookings. Let’s assume another half of your bookings called you instead of booking online (a rough estimate) so times the above total revenue by 2 and you should have a fairly accurate idea of the business value that your TripAdvisor listing provided to you for the year. Take that total number and divide that by the business listing expense. This gives you your return on investment. As above go into Google Analytics and select your dates to show the previous year on the anniversary of your business listing renewal. Select “Compare To” below the date field and set the previous year. This will let you see last year vs. the year before. Go to “Acquisition” > “All Traffic” > “Referrals”. Find and click on TripAdvisor (will be one of the sources). From here you can see the total traffic received from TripAdvisor for this time period. Take a quick glance at what you received the previous year to get an idea of the trend. Let’s be conservative and estimate that 1.25% of people that visit your website will end up booking online after viewing your website. And once again let’s assume you get another half of your bookings through the phone. So that’s 2.5% of the visits TripAdvisor sent you actually booked a room. Multiply that 2.5% by the visits you received and you should get a number of bookings you received. Next, estimate the average total price of a booking that your property receives such as $400. Your booking engine should be able to give you a number in the reports section. Finally, take that booking value and multiply it against the number of bookings. That will give you the total revenue. If you want to get to see a return on investment percentage take your total revenue and divide it by the price of your business listing. 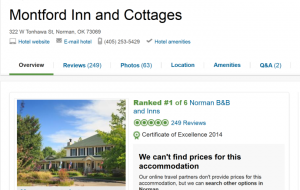 In 2014 the Red Oak Inn received 3 bookings that resulted in $1,635 tracked bookings from TripAdvisor. In 2014 the Red Oak Inn received 941 visits to their website from TripAdvisor. Let’s assume that 1.25% of people that visit your website end up booking a room online. Let’s assume another 1.25% of those people will call us and book a room. That’s 2.5% of people that visit the website end up converting. So, you have calculated the ROI of your TripAdvisor investment. What do you do now? Do you renew the listing or cancel and reinvest in another channel? It all depends on what the data tells you and what you believe your marketing ROI should achieve. 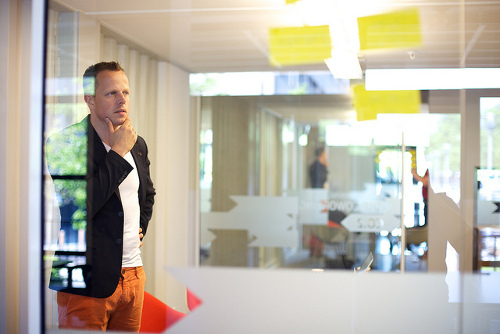 We believe 200 – 300% ROI is very reasonable to expect. This is doubling or tripling the money you invested with bookings. If you are considering a renewal of a listing pull the data and share it when you speak with the representative (it might take some persistence to talk to someone). Using the data to justify what you believe will be a fair rate has proven to be more effective for our clients than other routes. Let’s be clear: TripAdvisor can provide a lot of value to your bed and breakfast or hotel and if they are sending you bookings far and above with a high ROI that YOU have calculated then pay the renewal. However, if they aren’t providing a high ROI consider canceling for a period of time to test if it affects your business. In the case of one client we went ahead and cancelled the listing and reinvested in a few things like producing more content and Facebook advertising where we are achieving a high ROI. In the case of another client they renewed and are seeing value from the listing. You might also consider whether you are in a rural setting with no competition nearby or in a heavy tourist location with lots of competition. Also, consider using TripAdvisor’s TripConnect service to drive direct bookings to your property on a pay per click model. Share your feedback on this guide or give us your story. Go ahead and contact us. Image courtesy of Sebastieaan ter Berg.